A 45-year-old man was referred to our facility because of an abnormal shadow on chest radiography. CT revealed a reticular and nodular shadow (figure 1). 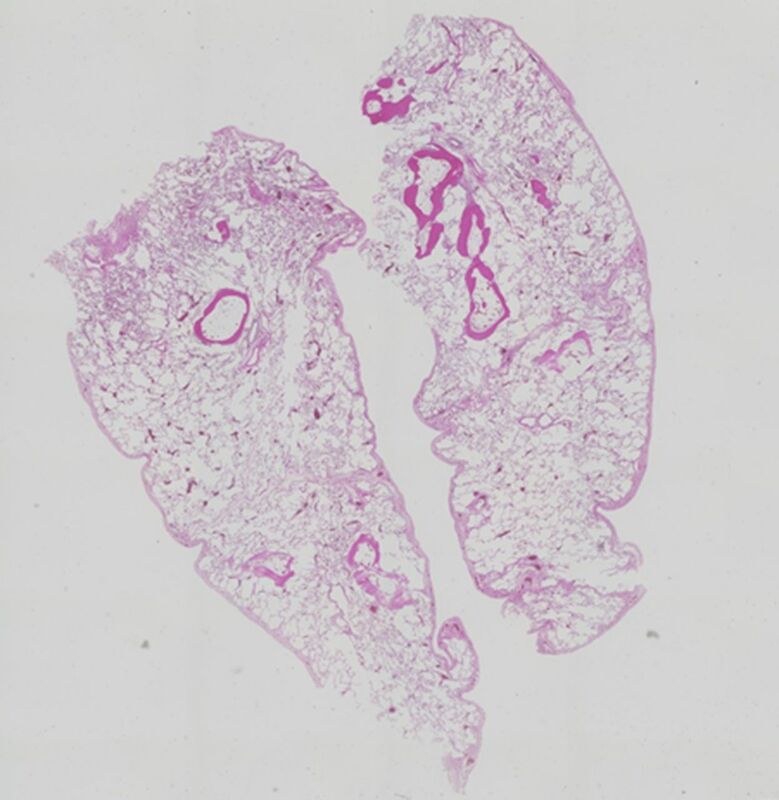 Histopathology of a surgical lung biopsy specimen showed dendriform mature bone formation with marrow residing within the alveolar spaces, which was diagnosed as dendriform pulmonary ossification (DPO) (figure 2). DPO is an extremely rare disease. 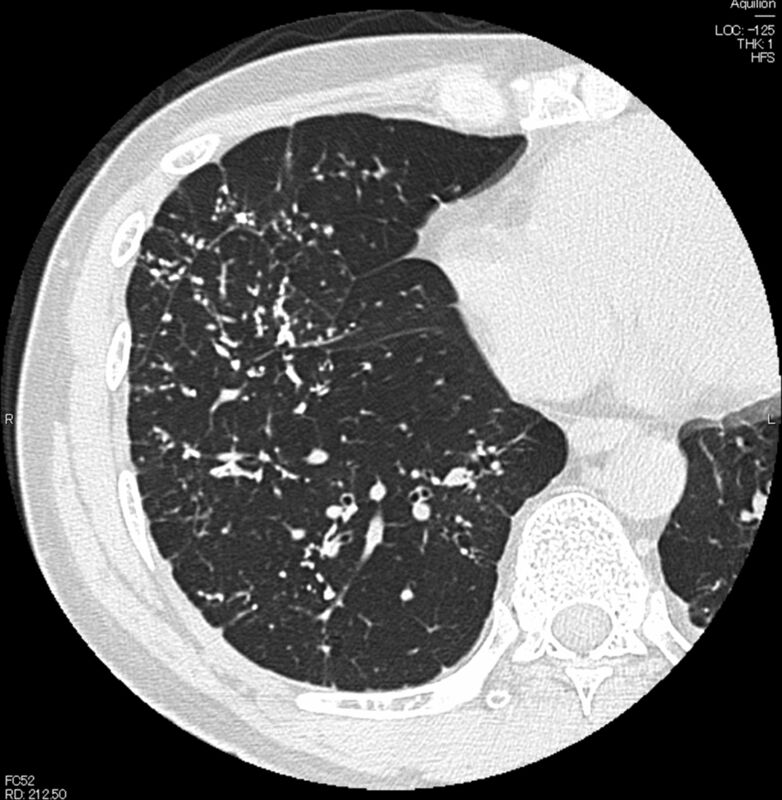 Chest high-resolution CT showing small, calcified branching shadows, with some fibrotic change noted. Histopathology of a biopsied pulmonary specimen showing dendriform mature bone formation with marrow within the alveolar spaces. A scanning acoustic microscope is a device that uses ultrasound to image an object or tissue.1 The data are digitised and color-coded for display. The speed of sound (SOS) of the ossified pulmonary lesions is equal to that of normal bone (figure 3B, red area; mean SOS=3000 m/s)2 and is strikingly distinct from the SOS of normal lung tissue (figure 3A, B, white arrows; figure 3B, blue or green area; mean SOS=1550 m/s). Precise measurement of the tissue hardness may hint at the mechanism underlying this rare disease. Light microscopy of the biopsied pulmonary specimen, stained by H&E (A), and the corresponding acoustic image (B). Areas comprising bone showed a much faster speed of sound than observed in normal alveolar areas (white arrow).